NEW YORK, March 20, 2018 /3BL Media/ — The Governance & Accountability (G&A) Institute research team has found that eighty-five percent (85%) of the companies in the S&P 500 Index® published sustainability or corporate responsibility reports in 2017. 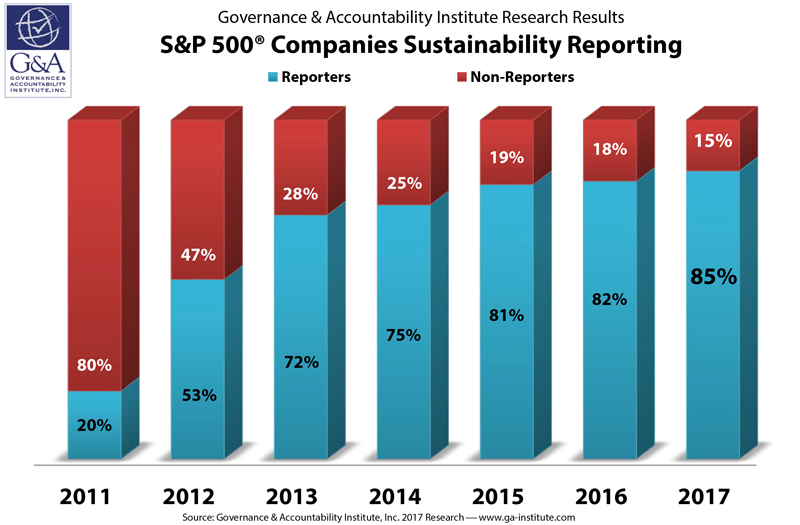 Entering 2018, just 15% of the S&P 500 declined to publish sustainability reports. 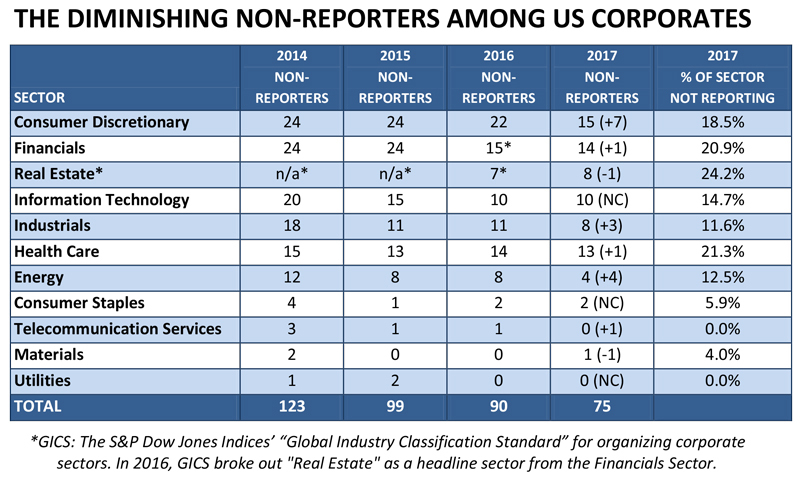 The practice of reporting by the 500 companies is holding steady with minor increases year after year. The attached chart represents the trends of S&P 500 sustainability reporting over the last seven years. Louis Coppola, EVP & Co-Founder of G&A Institute, who designs and manages the annual analysis, notes: "One of the most powerful driving forces behind the rise in reporting is an increasing demand from all categories of investors for material, relevant, comparable, accurate and actionable ESG disclosure from companies they invest in. Mainstream investors constantly searching for larger returns have come to the conclusion that a company that considers their material Environmental, Social, and Governance opportunities and risks in their long-term strategies will outperform and outcompete those firms that do not. It's just a matter now of following the money." Hank Boerner, Chairman & Co-Founder of the Institute, observed: "We live in a period of conflicting views on critical issues, like the effects of climate change, the societal quest for greater diversity and inclusion, the importance of demonstrating environmental stewardship, the rising expectations for greater accountability of leadership and expectations related to product responsibility. 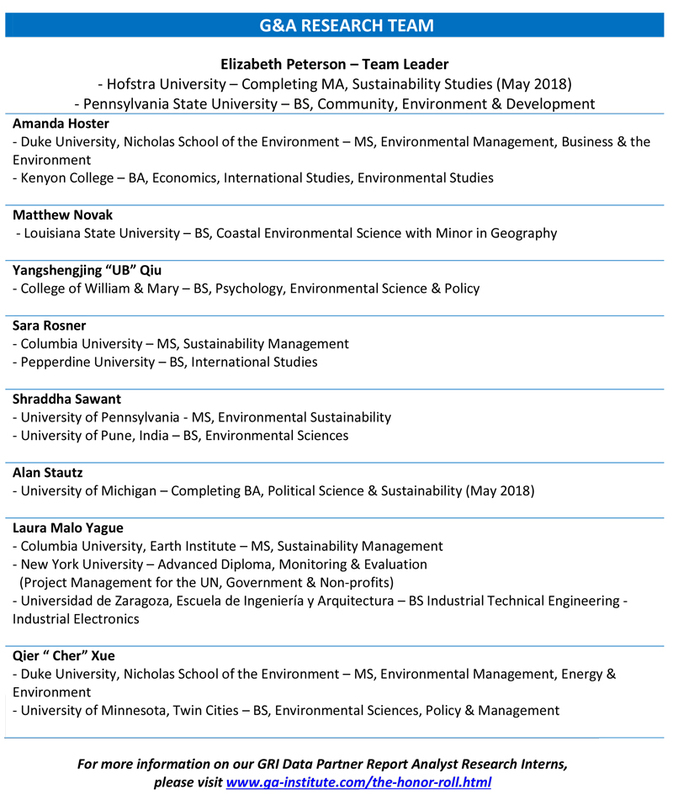 The attached chart presents the number of companies from each GICS* sector that do not publicly report on their sustainability opportunities, risks, strategies, actions, programs, and achievements between 2014 and 2017 -- implying no organized focus on corporate sustainability and ESG performance.